The word has its origins in the Italian language, in which it means either "loose gravel" or "stone made by cemented gravel". A breccia may have a variety of different origins, as indicated by the named types including sedimentary breccia, tectonic breccia, igneous breccia, impact breccia, and hydrothermal breccia. Sedimentary breccia is a type of clastic sedimentary rock which is made of angular to subangular, randomly oriented clasts of other sedimentary rocks. A conglomerate, by contrast, is a sedimentary rock composed of rounded fragments or clasts of pre-existing rocks. Both breccia and conglomerate are composed of fragments averaging greater than 2 millimetres (0.079 in) in size. The angular shape of the fragments indicates that the material has not been transported far from its source. Sedimentary breccia consists of angular, poorly sorted, immature fragments of rocks in a finer grained groundmass which are produced by mass wasting. It is lithified colluvium or scree. Thick sequences of sedimentary (colluvial) breccia are generally formed next to fault scarps in grabens. Breccia may occur along a buried stream channel where it indicates accumulation along a juvenile or rapidly flowing stream. Sedimentary breccia may be formed by submarine debris flows. Turbidites occur as fine-grained peripheral deposits to sedimentary breccia flows. In a karst terrain, a collapse breccia may form due to collapse of rock into a sinkhole or in cave development. Broken, fragmental rocks produced by intrusive processes, usually associated with plutons or porphyry stocks. Lavas may also pick up rock fragments, especially if flowing over unconsolidated rubble on the flanks of a volcano, and these form volcanic breccias, also called pillow breccias. Within the volcanic conduits of explosive volcanoes the volcanic breccia environment merges into the intrusive breccia environment. There the upwelling lava tends to solidify during quiescent intervals only to be shattered by ensuing eruptions. Clastic rocks are also commonly found in shallow subvolcanic intrusions such as porphyry stocks, granites and kimberlite pipes, where they are transitional with volcanic breccias. Intrusive rocks can become brecciated in appearance by multiple stages of intrusion, especially if fresh magma is intruded into partly consolidated or solidified magma. This may be seen in many granite intrusions where later aplite veins form a late-stage stockwork through earlier phases of the granite mass. When particularly intense, the rock may appear as a chaotic breccia. accumulation of xenoliths within a feeder conduit or vent conduit. Impact breccias are thought to be diagnostic of an impact event such as an asteroid or comet striking the Earth and are normally found at impact craters. Impact breccia, a type of impactite, forms during the process of impact cratering when large meteorites or comets impact with the Earth or other rocky planets or asteroids. Breccia of this type may be present on or beneath the floor of the crater, in the rim, or in the ejecta expelled beyond the crater. Impact breccia may be identified by its occurrence in or around a known impact crater, and/or an association with other products of impact cratering such as shatter cones, impact glass, shocked minerals, and chemical and isotopic evidence of contamination with extraterrestrial material (e.g. iridium and osmium anomalies). An example of an impact breccia is the Neugrund breccia, which was formed in the Neugrund impact. Hydrothermal breccias usually form at shallow crustal levels (<1 km) between 150 and 350 °C, when seismic or volcanic activity causes a void to open along a fault deep underground. The void draws in hot water, and as pressure in the cavity drops, the water violently boils. In addition, the sudden opening of a cavity causes rock at the sides of the fault to destabilise and implode inwards, and the broken rock gets caught up in a churning mixture of rock, steam and boiling water. Rock fragments collide with each other and the sides of the void, and the angular fragments become more rounded. Volatile gases are lost to the steam phase as boiling continues, in particular carbon dioxide. As a result, the chemistry of the fluids changes and ore minerals rapidly precipitate. Breccia-hosted ore deposits are quite common. The morphology of breccias associated with ore deposits varies from tabular sheeted veins and clastic dikes associated with overpressured sedimentary strata, to large-scale intrusive diatreme breccias (breccia pipes), or even some synsedimentary diatremes formed solely by the overpressure of pore fluid within sedimentary basins. Hydrothermal breccias are usually formed by hydrofracturing of rocks by highly pressured hydrothermal fluids. They are typical of the epithermal ore environment and are intimately associated with intrusive-related ore deposits such as skarns, greisens and porphyry-related mineralisation. Epithermal deposits are mined for copper, silver and gold. In the mesothermal regime, at much greater depths, fluids under lithostatic pressure can be released during seismic activity associated with mountain building. The pressurised fluids ascend towards shallower crustal levels that are under lower hydrostatic pressure. On their journey, high-pressure fluids crack rock by hydrofracturing, forming an angular in situ breccia. Rounding of rock fragments is less common in the mesothermal regime, as the formational event is brief. If boiling occurs, methane and hydrogen sulfide may be lost to the steam phase, and ore may precipitate. Mesothermal deposits are often mined for gold. For thousands of years, the striking visual appearance of breccias has made them a popular sculptural and architectural material. Breccia was used for column bases in the Minoan palace of Knossos on Crete in about 1800 BC. Breccia was used on a limited scale by the ancient Egyptians; one of the best-known examples is the statue of the goddess Tawaret in the British Museum. It was regarded by the Romans as an especially precious stone and was often used in high-profile public buildings. Many types of marble are brecciated, such as Breccia Oniciata or Breche Nouvelle. Breccia is most often used as an ornamental or facing material in walls and columns. A particularly striking example can be seen in the Pantheon in Rome, which features two gigantic columns of pavonazzetto, a breccia from Phrygia (in modern Turkey). Pavonazzetto obtains its name from its extremely colourful appearance, which is reminiscent of a peacock's feathers (pavone is "peacock" in Italian). ^ Glossary of Meteoritical Terms. Meteorlab.com. Retrieved on 2011-06-22. ^ Mitcham, T. W. (1974). "Origin of breccia pipes". American Journal of Science. 69 (3): 412–413. doi:10.2113/gsecongeo.69.3.412. 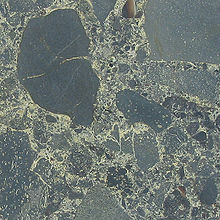 Wikimedia Commons has media related to Breccia. Wikisource has the text of the 1911 Encyclopædia Britannica article Breccia. Sibson, R.H. (1987). "Earthquake rupturing as a mineralizing agent in hydrothermal systems". Geology. 15 (8): 701–704. Bibcode:1987Geo....15..701S. doi:10.1130/0091-7613(1987)15<701:ERAAMA>2.0.CO;2. ISSN 0091-7613. Sibson, R.H. (2000). "Fluid involvement in normal faulting". Journal of Geodynamics. 29 (3–5): 469–499. Bibcode:2000JGeo...29..469S. doi:10.1016/S0264-3707(99)00042-3.